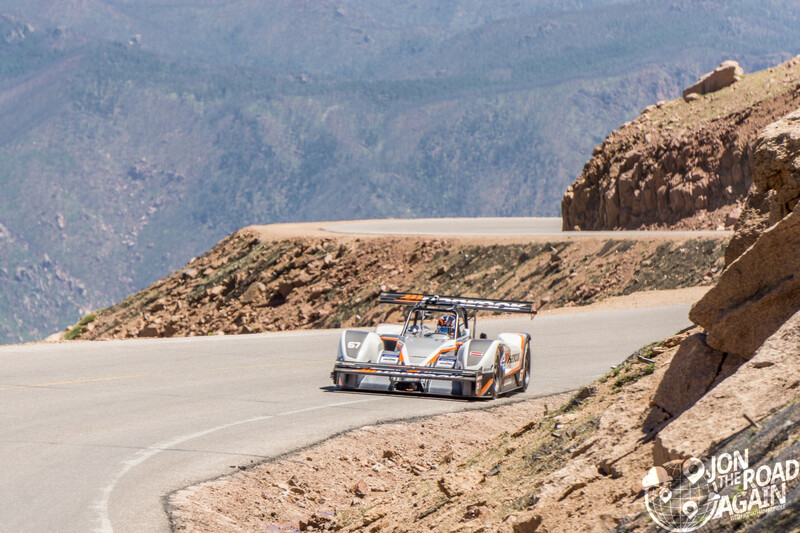 The Pikes Peak International Hill Climb is one of the great American motorsports events. 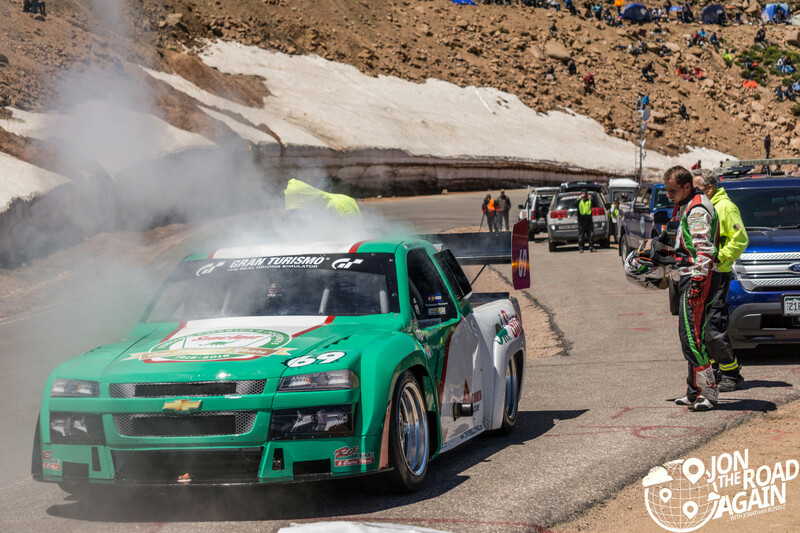 Started in 1916, it’s the 2nd oldest event in the country (the Indianapolis 500 is the oldest, starting in 1911) and it’s run right up the face of “America’s Mountain” Pikes Peak. 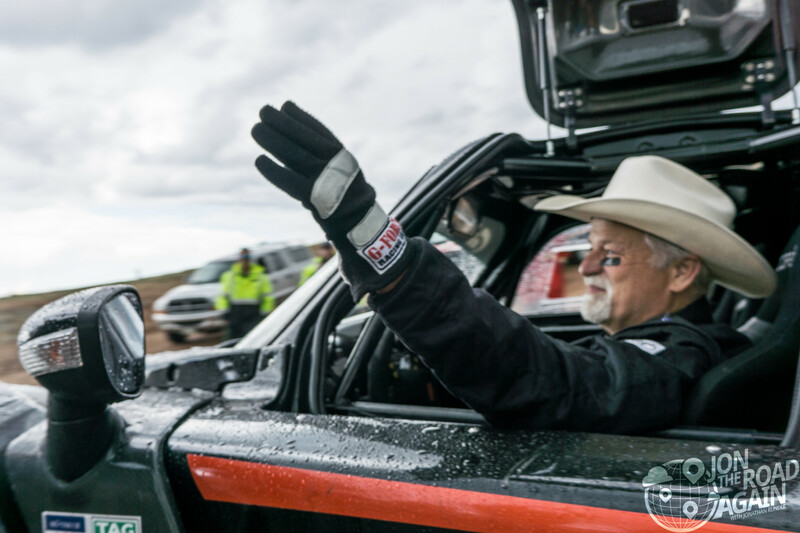 With this being the 100th anniversary of the race, I called up my uncle and my dad and convinced them to come with me to Colorado to take part in the festivities. This is our race report. The day started at 1:30 am. 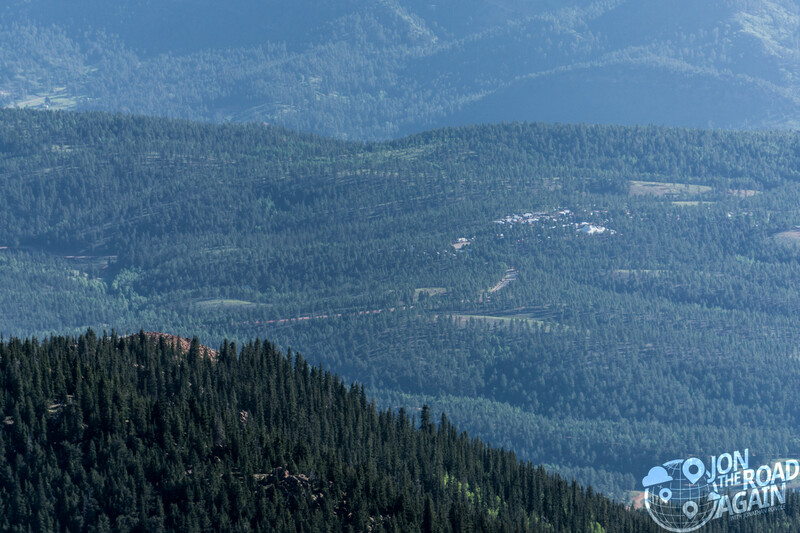 They’re expecting more than 10,000 spectators on the mountain and the best spots are first come, first served. So, we elected to get up early and head to Devil’s Playground – at 12,780 ft. it is the highest spectator’s spot on the mountain. Having secured a media pass for the day, we were allowed to go up on the mountain an hour before spectators. We arrived at the gates right around 2:30 am and already people we stacking up trying to get in. Thankfully, the media pass allowed us to pass the traffic and head up the hill. We reached Devil’s Playground about an hour later. Time to catch some sleep. Around 5:00 am I could feel the light creeping in under my eyelids and decided I had better get a photo. As you can see, plenty of people have staked their spot on the first ridge overlooking the course. After a few chilly minutes, I duck back into the car for another two hours of sleep. 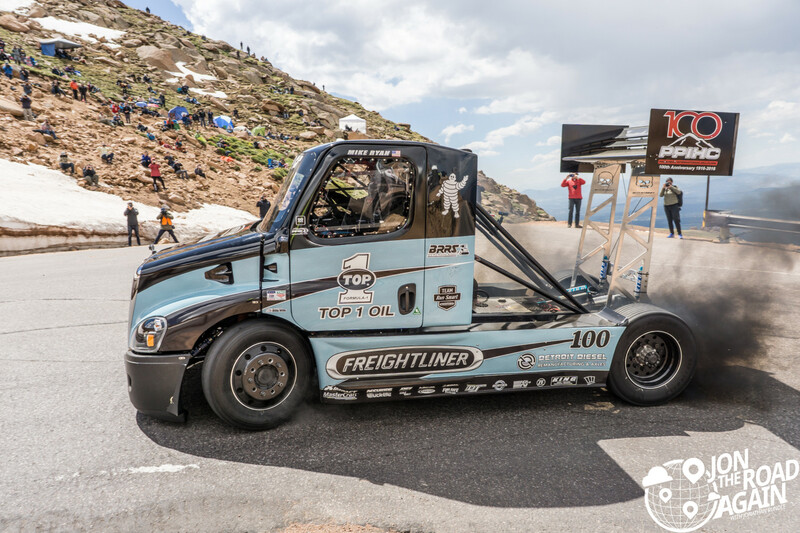 The race started to fire up around 8am, with some ceremonial cars and trucks coming up the mountain. In the photo below, you can see my zoom straining to show the start line and pit area. 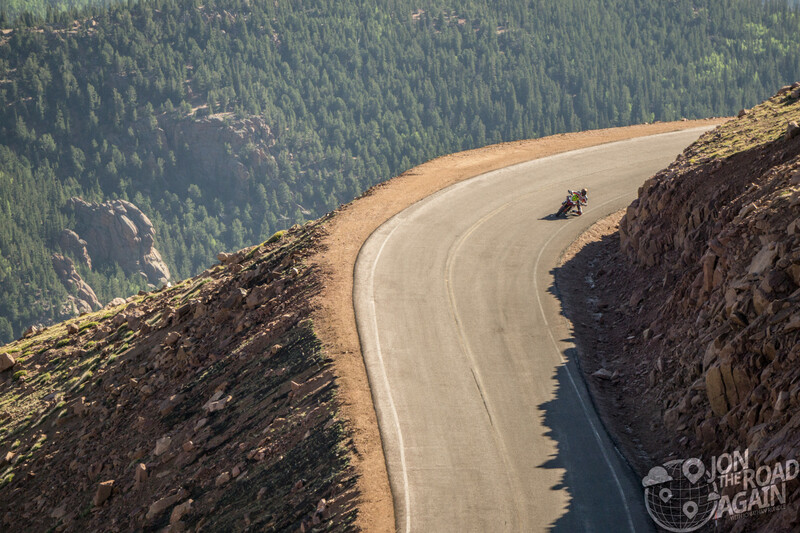 That’s about 8 course-miles away and a full 3,000 feet below Devil’s Playground in elevation. What makes Devil’s Playground so great is that you can see all the twists and turns from Halfway Picnic Grounds all the way to the final stretch to the summit. There is simply no other place on the course to see as much of the race. 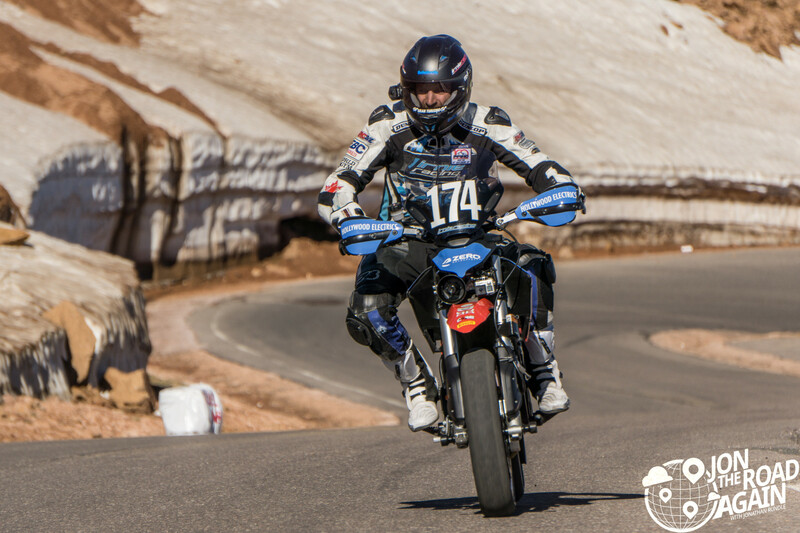 Starting things off are the motorcycles, with a ceremonial recon mission by the fastest motorcyclist in Pikes Peak history, Carlin Dunne. 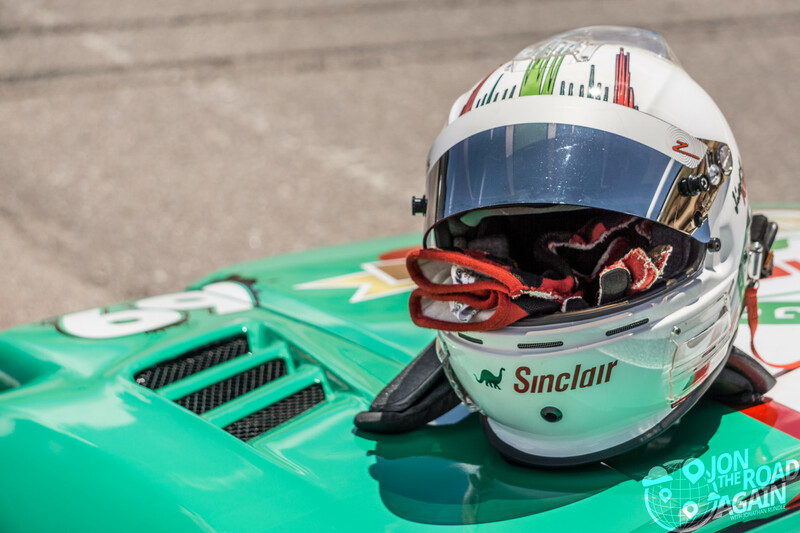 Once Carlin made it to the top, he recounted the conditions on the track for the rest of the racers. 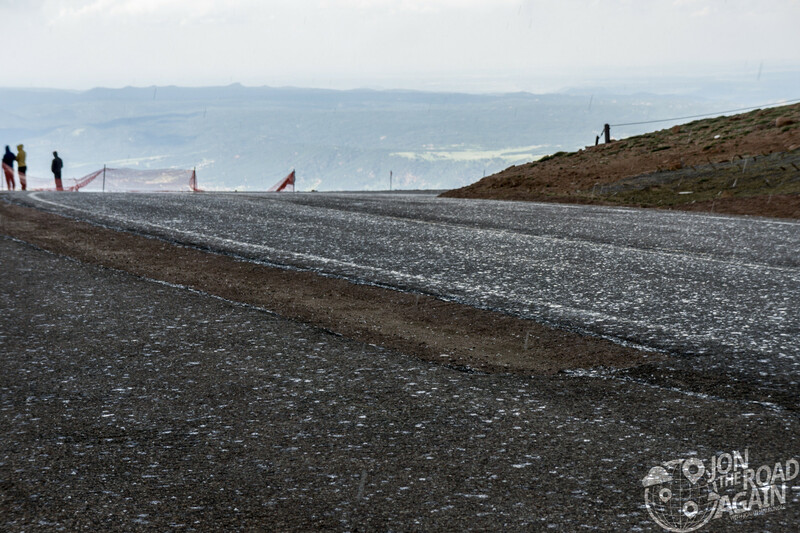 The shade was still wet from a rainstorm last night, and the summit still had some snow on the roadway. 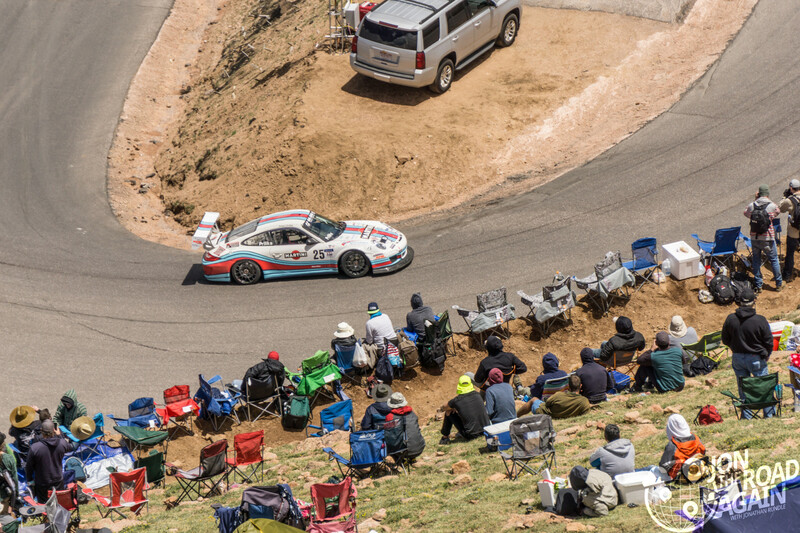 I parked myself in the corners just below the spectator area so I could get a ground level view of the competition. 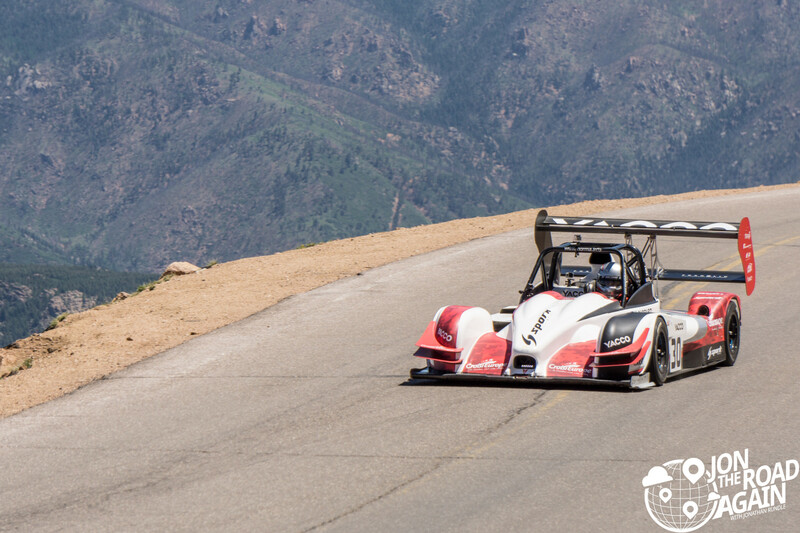 The Victory electric prototype is “King of the Mountain” today, but not everyone had spectacular runs. 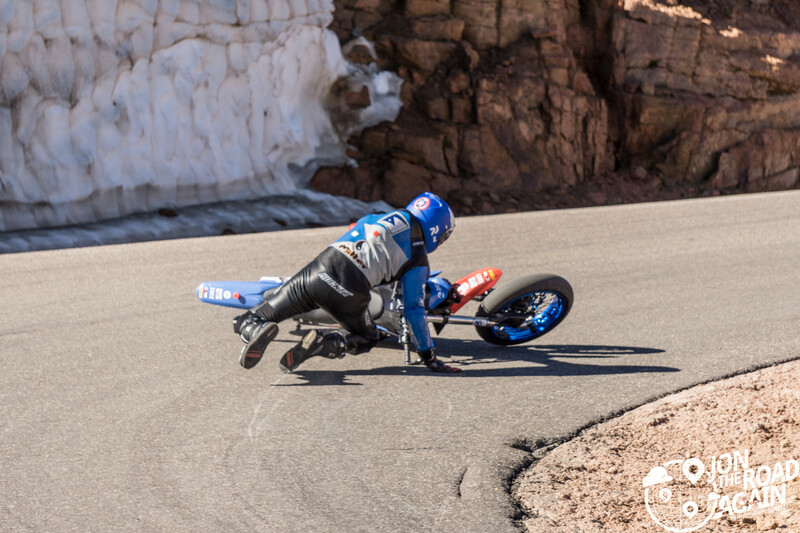 Mark Miller takes a spill on his Zero electric motorcycle after his knee puck seemed to catch in the corner. Someone (not me, I swear) picked it up for a souvenir. 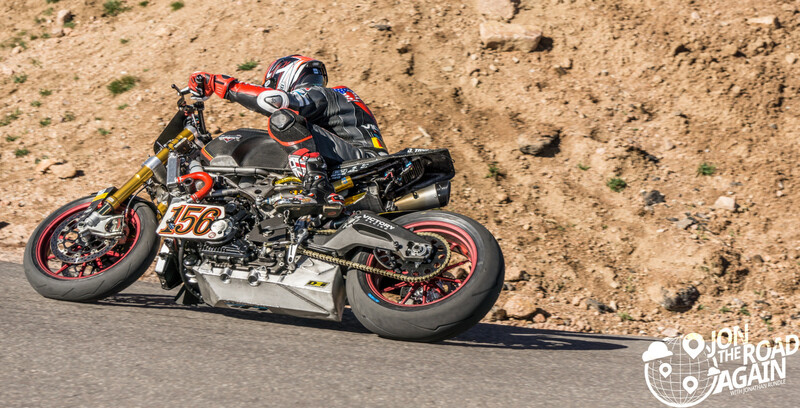 The sidecars were absolutely wild to watch. 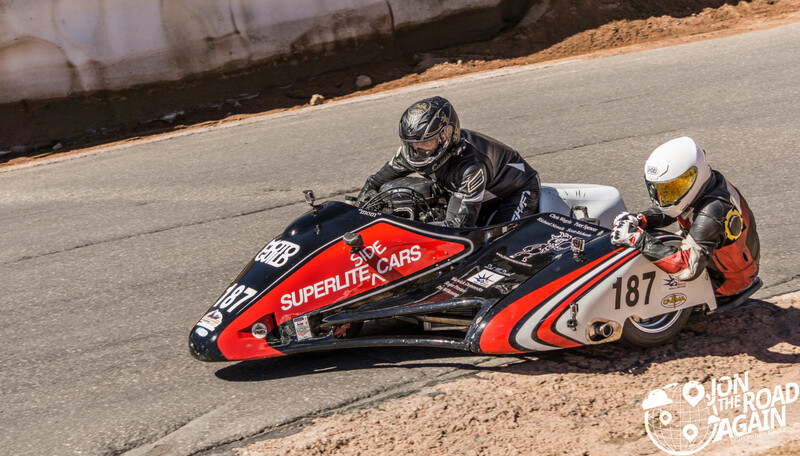 Pictured below, John Wood captured first in the sidecar divison. Adding to the spectacle of the day was the helicopter that followed the competitors around the track. 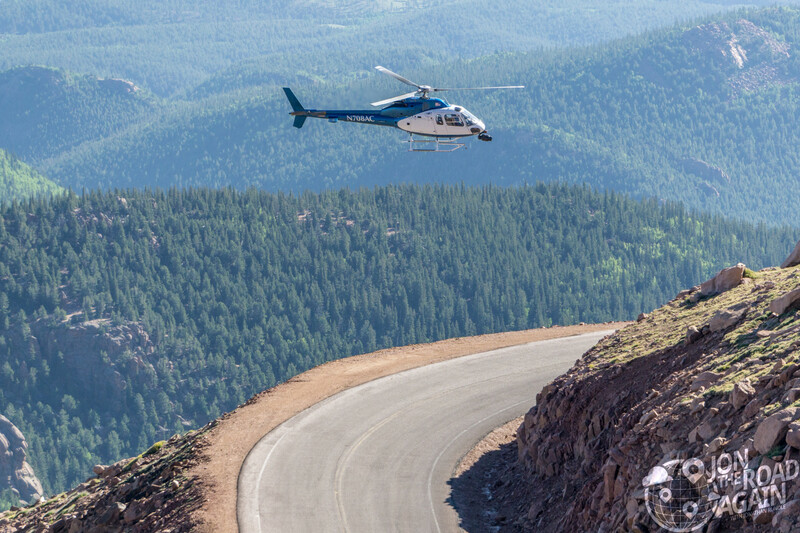 It was pretty cool to be above the helicopter’s line of sight as we watched it trace the competitors all the way from the starting line to the summit. 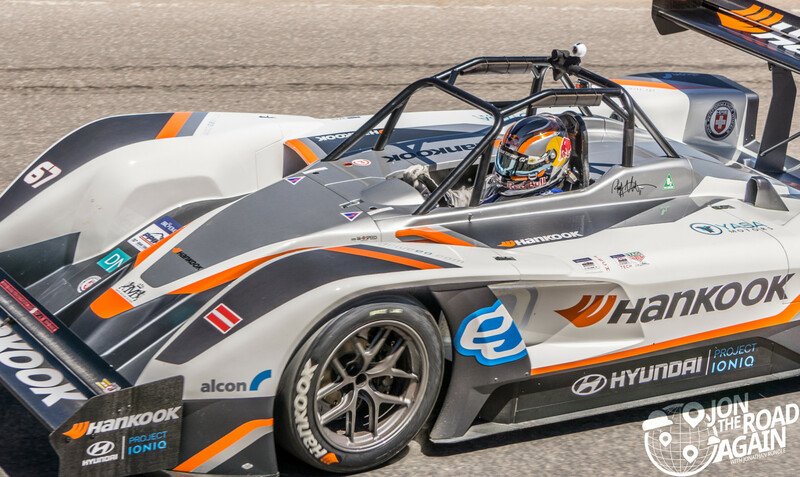 The first competitor of the day was also the day’s fastest. 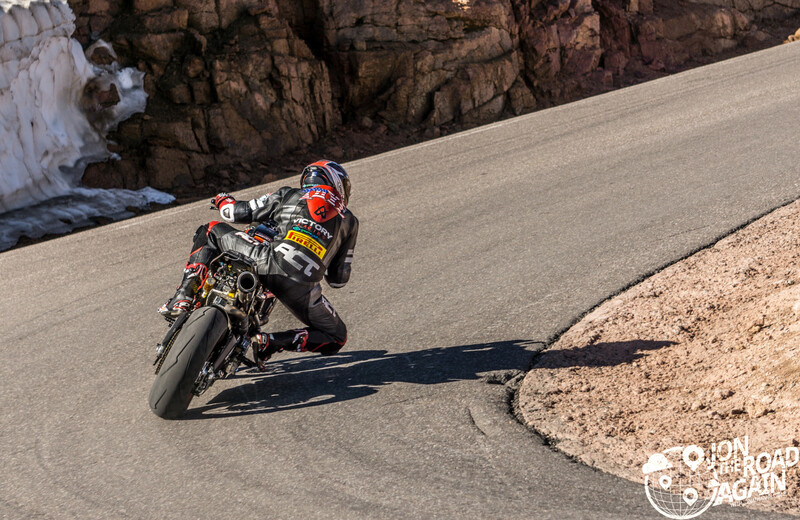 Romain Dumas was fresh off of winning the 24-hours of LeMans a week earlier and came to Pike Peak to win with an 8:51. 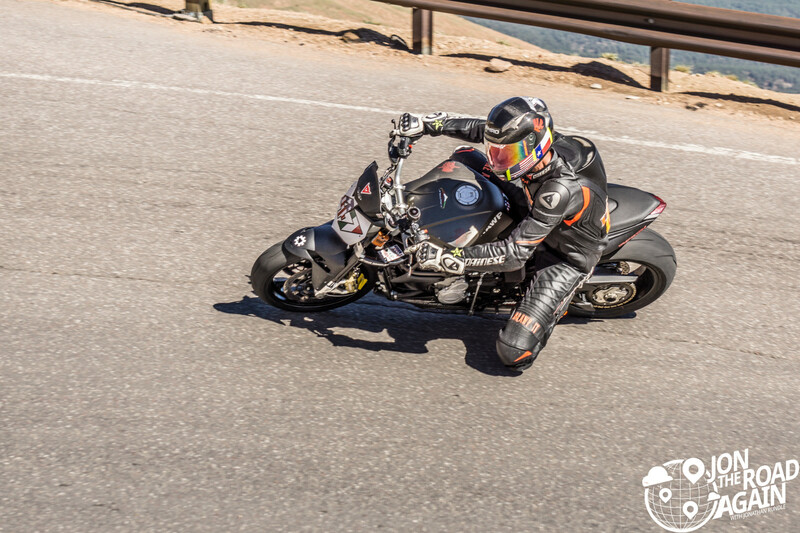 Only three men have went under 9 minutes up the mountain. 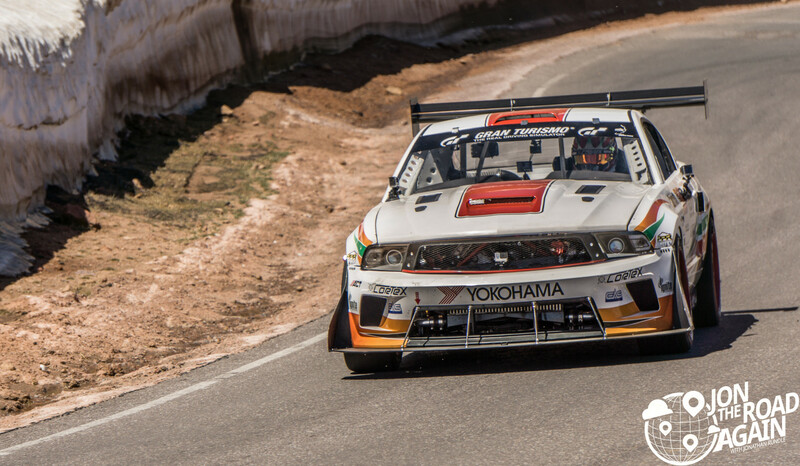 Sebastien Loeb, Romain Dumas and the next competitor, Rhys Millen. Rhys Millen did it in 8:57, and could have been even faster if he didn’t spin out in my curve. But at least I got right on top of it for a good photo. A fan favorite is Nobuhiro Tajima. Nicknamed “Monster” because he is a very large man and because he is a legend. 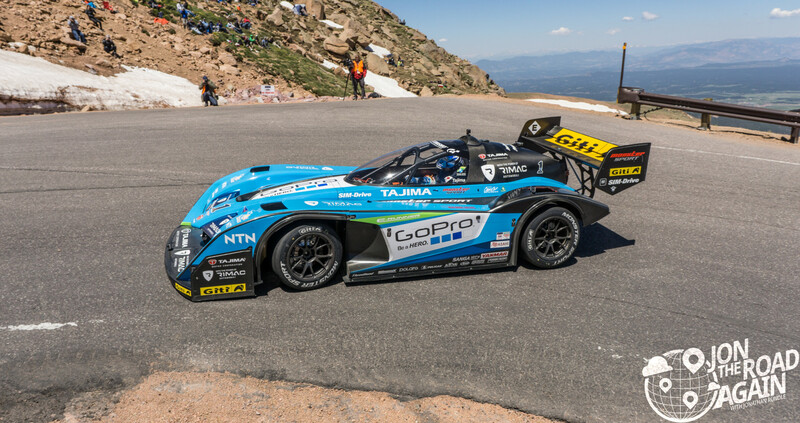 He won the Pikes Peak International Hill Climb numerous times. 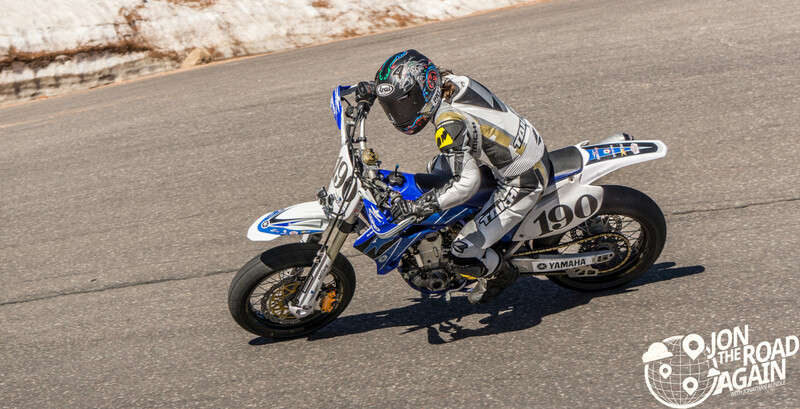 Poor Jimmy Keeney earned a DNF after overheating in my corner. Better luck next year, Jimmy. Speaking of DNF’s, there were a lot of red flags this year. The race stretched into the late afternoon and we were only half way through the pack of 100 competitors. 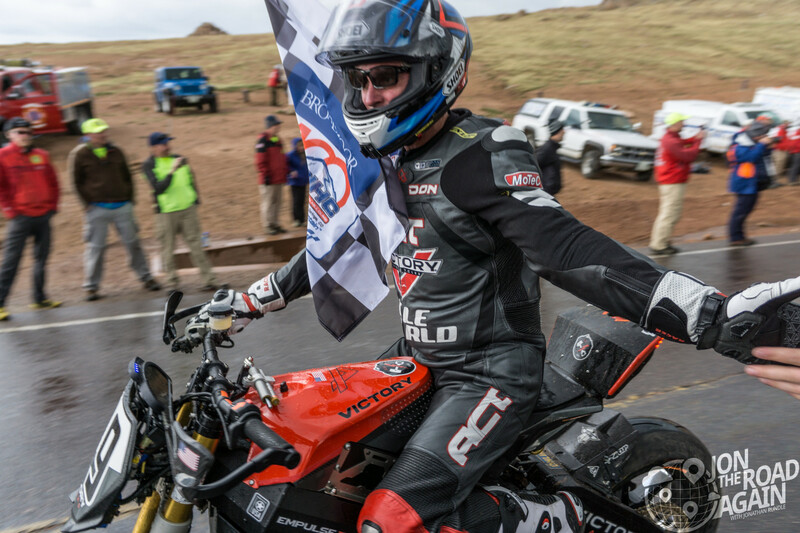 During once of these extended red flags, I made my way up from the race track to the spectator area. I really found that there were no bad seats in Devil’s Playground. Since I had a radio, and many spectators did not, I made a few new friends who insisted I stick around with them (so they could know what was going on during the race). 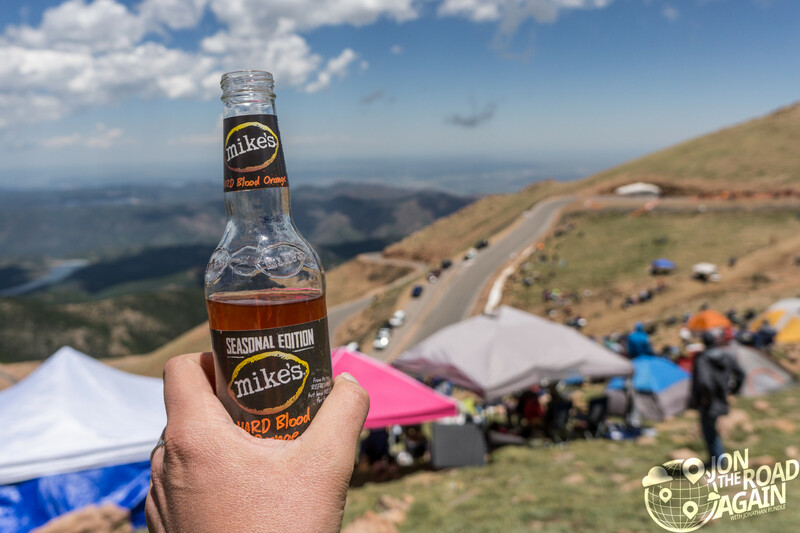 I drank a lukewarm Mike’s and headed back down to the track once the race began again. Thanks for your hospitality, fellas! Only a few competitors remained, but they were crowd favorites. 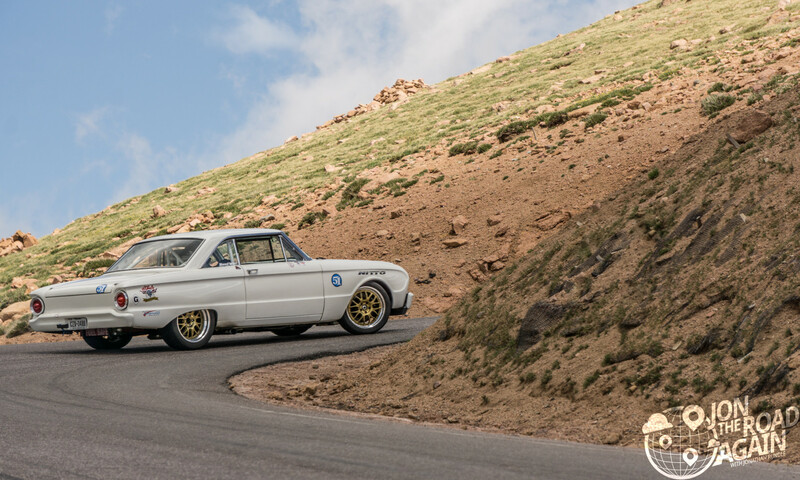 Gas Monkey Garage guy Aaron Kaufman in his 1961 Ford Falcon and Mike Ryan in his Freightliner. 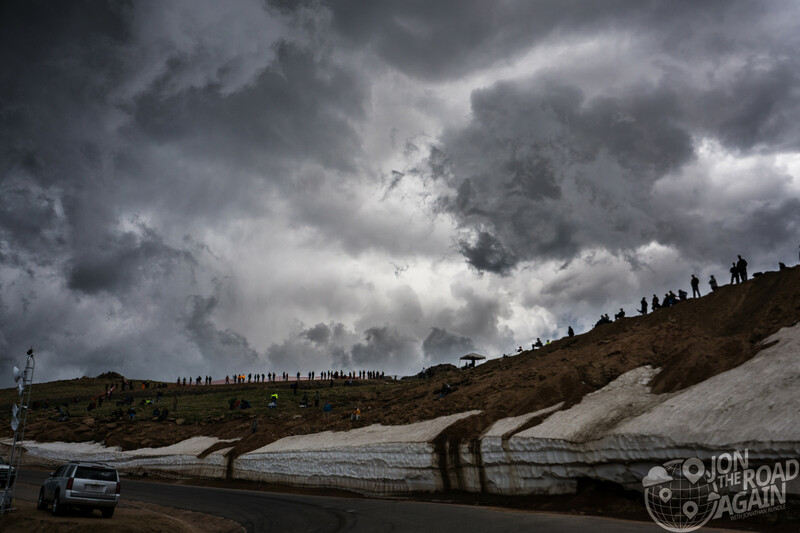 Ominous skies started to roll in and we wondered it we’d see the final few racers make a charge to the summit. It held off long enough to finish. It wasn’t long before the hail began falling from the skies and most people ran for cover. 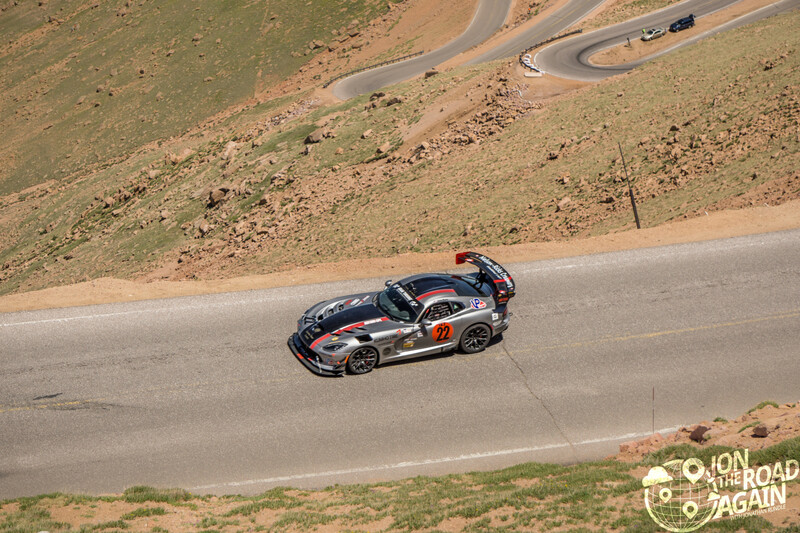 At the end of the race, all of the competitors come down from the summit. 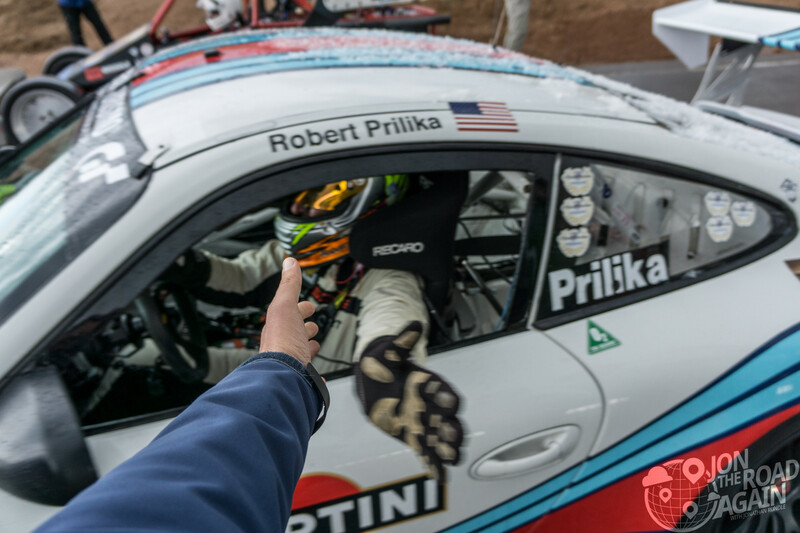 Line up along the road to give your congratulations and high fives to all the racers. As I said before, this is a bucket list event. 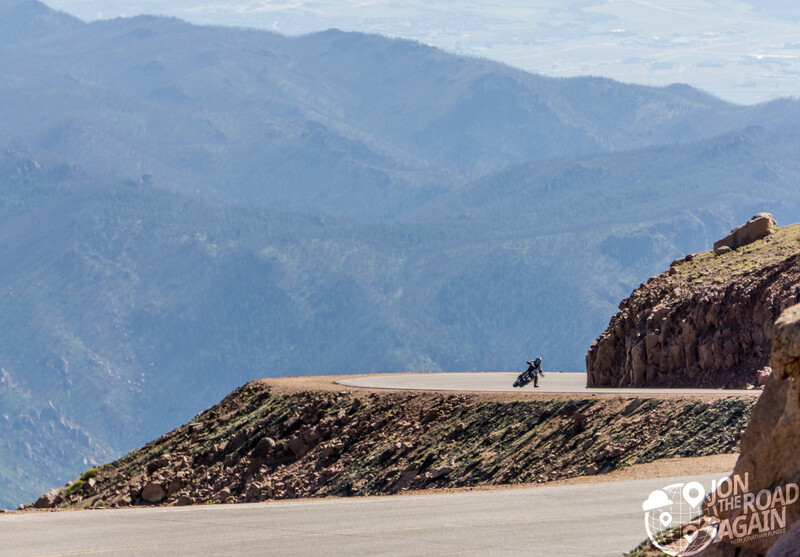 Plan ahead as best you can, Colorado Springs is a popular destination year-round, as a result rooms may be few and far between on event weekend. Grab tickets and more information at the official website. Wonderful blog. Amazing pictures You are very talented Thanks for the ride along . Great shots with the camera! Enjoyed being there with you and Brian!